Here you can find matching setup charts for both the 1940 and the 1942 scenario. The boards are first edition and don’t incorporate some small adjustments to the board that came with 2nd edition. 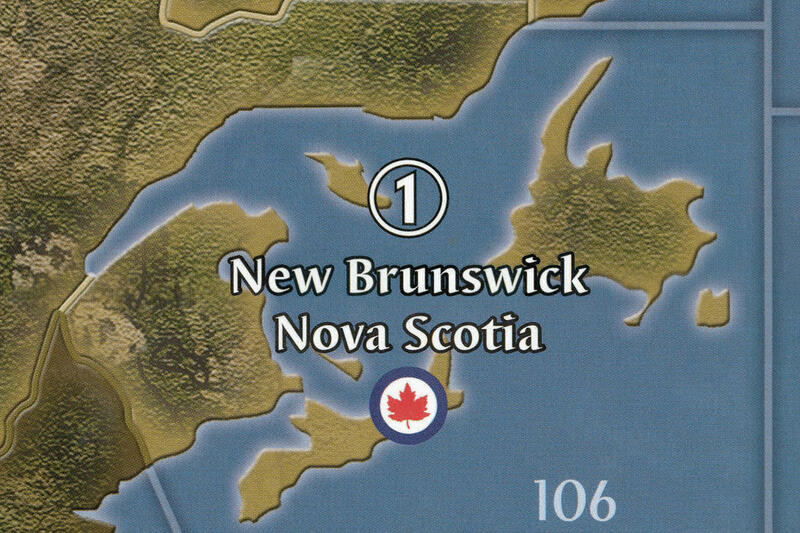 Like Alberta & Central United States now sharing a border as well as Quebec and New Brunswick. The original board had already seen tons of battles and as a result the digital scan shows battle scars and stains across the map. Due to the difficult job of stitching together the different scans and seems in the board some malformation of territories, borders or names are present. How are you able to post a picture that “moves” and shows before and after? Next how do you remove the imperfections from the scan of the map and just retouch the artwork with either the water or land textures? What program is that CS3? Create an (animated) GIF, rename the file extension from gif to jpg, embed or upload the “fake” jpg. Cool nice job! Incase you didn’t know, im already redoing the map, not that mine is better or anything, but its totally rescaled in Europe/Africa just incase that’s something that interests you. If not, then keep going man, nice to see more map editors. Animated GIF as P@nter replied correctly. Using many of the online gif makers (I used gifmaker for no specific reason) it’s very simple to creat your animated gif. Next I’ve uploaded them to mediafire and that gives you a jpg link you can use when you press the “insert image” option. I actually got the idea of posting it this way on siredblood’s new map thread. He used it there as well. I use a great open source program called GIMP. Call if the open source photoshop if you want. But despite the tool the trick is to manual copy-paste similar looking areas and blend them in by making the edges of your pasted area more transparent. It’s a time consuming task and often takes mulitple attempts before it is ‘right’. Thanks siredblood! I’ve seen your thread and really looking forward to your next sneak preview. 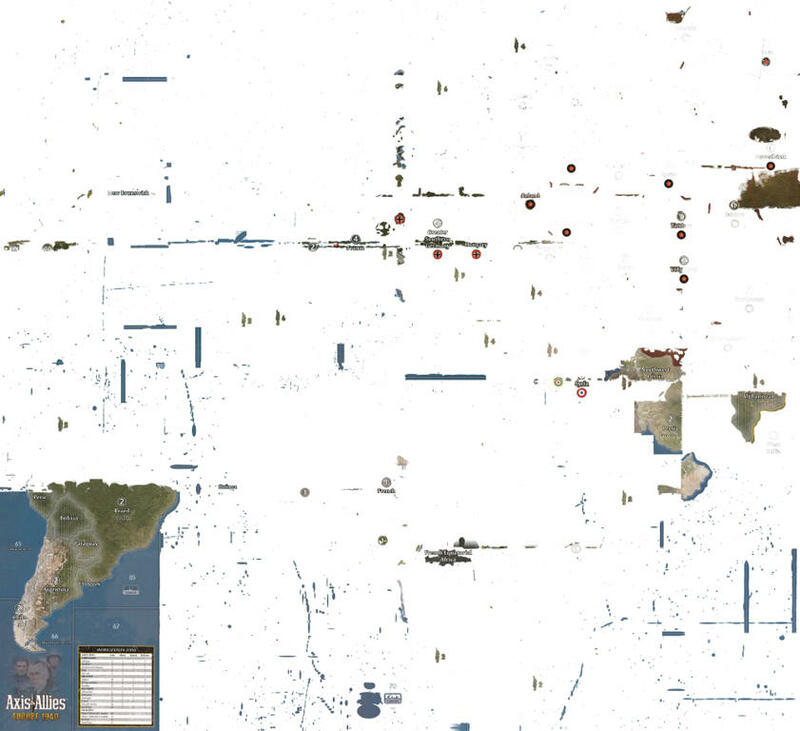 Although I understand the reason for rescaling parts of the map, I personally don’t like it that much. An update on Latin America. I’ve finished the face lift. Brasil gave me some challenges as the board fold goes straight through this country. This wouldn’t be a big problem if it wasn’t a Pro Allied neutral with the angled lines running through it. 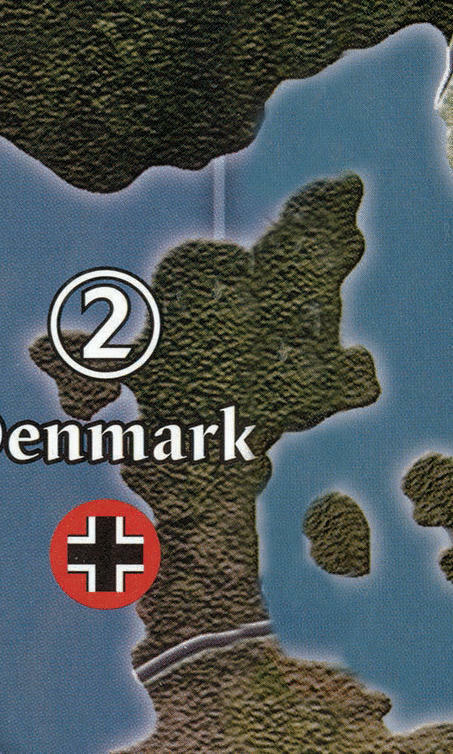 The solution to restoring those lines to run straight again was to move the bottom half of the continent only slightly downwards and fix the textures over the original fold line. Don’t bother the white pixel noise on the right sight of the images. This is an artifact from the animated gif creater. It’s not there in reality. As an added bonus I decided to remove the standing army symbols for the neutral countries. 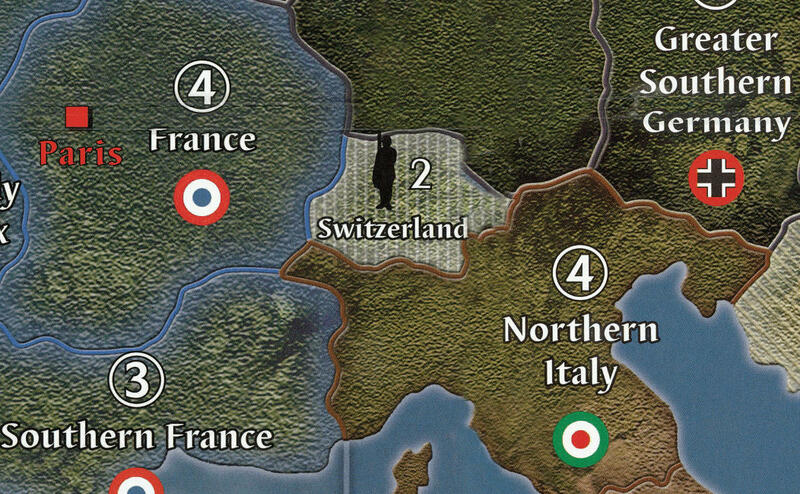 I will be playing with neutral miniatures and will create a setup chart similar to the other nations. So no need for this extra clutter on the board. This layer is optional, so when I’m done I will share the files both with and without the neutral standing army symbols. 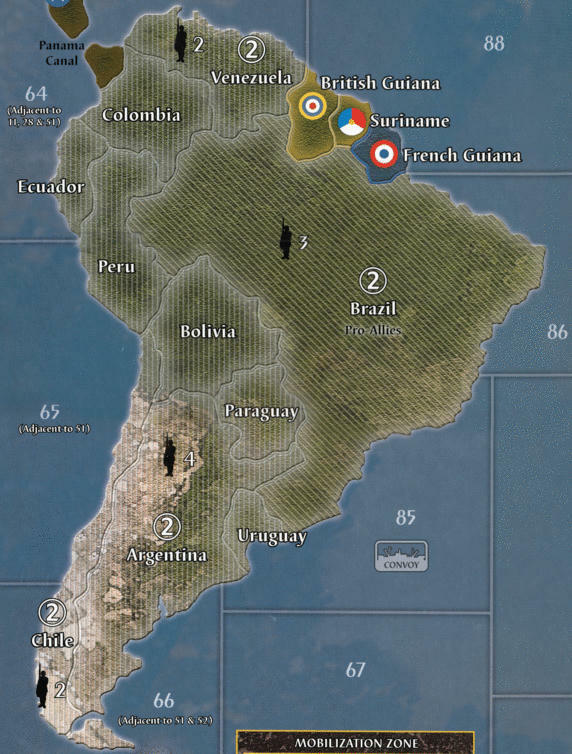 South America is too long now. I’ll never be able to sail around it on one tank of gas. I know, you already plan 2 versions with different layers, like the standing armies on neutrals. What features of the Ambilzi/YG map will you keep on your map? Or will you go with the plain original map? Will there maybe be more than 2 Layer Versions? Personally, I would especialy find the Naval/Air Bases very useful and the extended income tracker. I’m working with the plain original map, because I like a clean map as a map only and have all the other stuff like battle boards, cost charts, income tracker apart from the board. 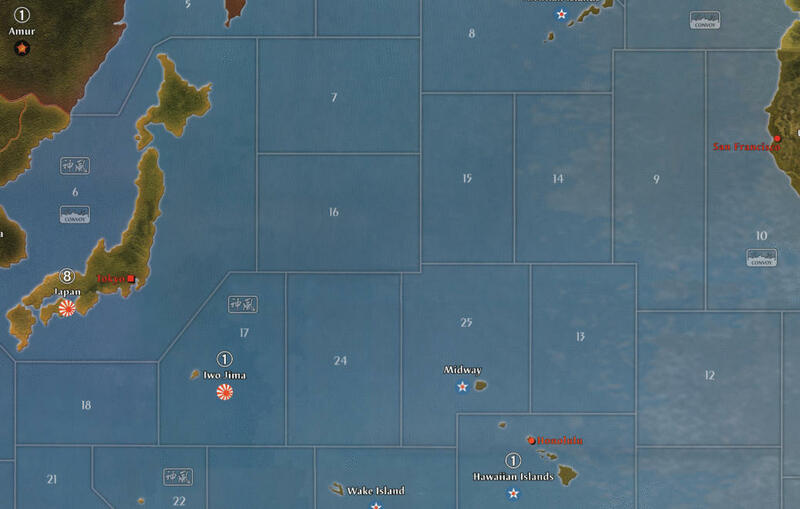 But with this ‘clean’ map as a basis, it shouldn’t be a big challenge to blend back in the naval and air bases or any of the other features from the full Ambilzi/YG map. That sounds like a fair deal! A quick update. Africa and the Middle East have been fixed. Especially the neutrals in the Middle East proved to be challenging. Now rolling into the USSR. Your right about the font, i now remember that the Franklin font looked better so i went with that. That’s not a problem. Do you happen to know what the original font was called? Yes!! Finally managed to finish the European Theater of the map. Just for you all to get a feeling of how big this rework is to fix all the dust particles, scratches, fold creases and scan line - I’ve added a picture that shows all the changes to the original map. The results are very satisfying and I cannot wait to finish the Pacific theather and get this clean map printed. WOW, you can really see where the boards were stitched together. Quick update to you all. 6 months have passed, but not without progress on the map! I’ve fixed all lands / islands except for America on the pacific board. This work took forever to complete, but I’ve learned a lot on this journey and will retouch some of the things on the european side as well. 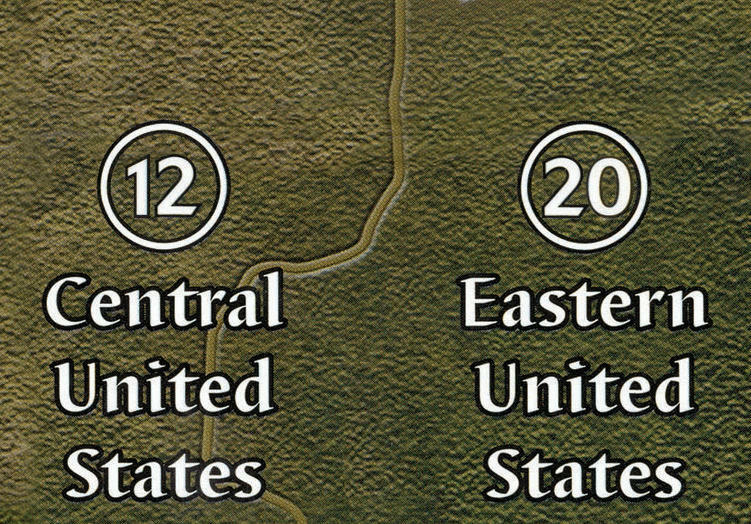 Especially better contrast on country names. 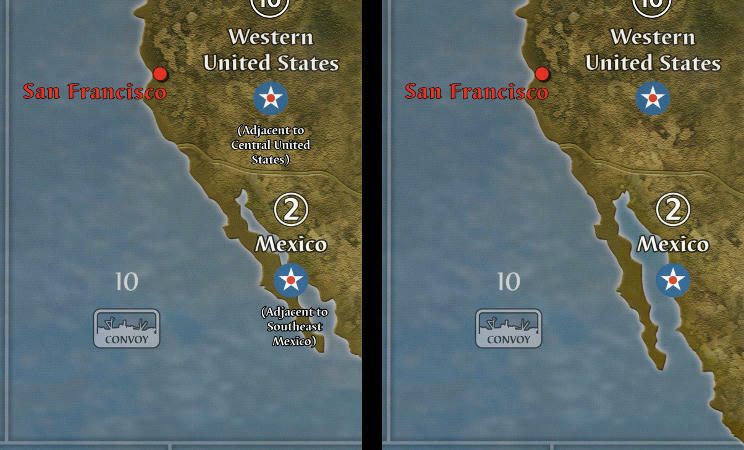 I’m currently battleing my way through the pacific to minimize the visible lines of where the scans have been stitched together. See this image as a reference of what I’m talking about. Just a quick update to let you all know this project is not dead. After some months out of the running I’m regaining energy and started working on this map again. Still some work to do, but I hope to be able to get you posted on a more regular basis. 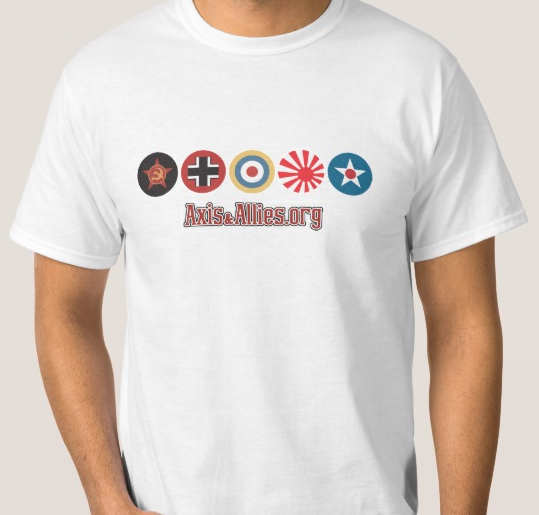 See my separate thread for my OOB map of Axis & Allies Anniversary Edition. This is what I’ve been working on the last week after contacting Young Grasshopper when I saw the problems with the warped boards on his Youtube channel. Nice! Looks like we both are back to maps at the same time!…. think we began around the same time as well. Some good progress lately. I’ve finished retouching all the scratches and other small damages on the boards / scans. As I found a way to scan my own boards in good quality I was even able to use my 2nd edition board itself to add the 2nd edition changes to the map. 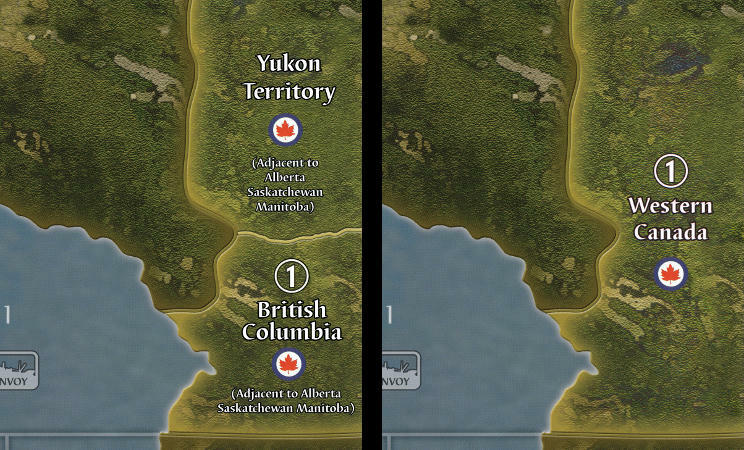 See the two examples below for Western Canada and Mexico (left: original map file from YG, right: 2nd edition changes). Note that using my own scan I was able to regenerate the original artwork on Western Canada and Western United States without visible color differences. Next stop: color correcting the visible overlaps between different scans. They are visible in the sea zones. Especially on the Pacific side of the board. "Tall Paul"s German units detailed and painted by the "WARMACHINE Team"
Thanks John, ill update this thread once more later when I finish those other troops… Oh I also replaced the some of the Japanese artillery with some from HBG, after which, I kinda liked the OOB ones better lol. Following up: I went out and bought a can of chrome spray-paint from a Blick arts-and-crafts store, and did a few tests on some B-17’s… I’ll post pictures if anyone wants to see them. It looks great. Nice, even coating… very lustrous. With some added details I think my late-war aircraft are going to look amazing. Thanks for the feedback, everyone. @jeffcamis: Can someone recommend a printer for a custom map make that doesnt charge 250 plus. Im located in north jersey area. I need a custom map for aa 50th anny edition. I have tge file i want to use. Thanks. Jeff. I’m not from New Jersey, but I am in America… I got my Scrim/Outdoor Banner Vinyl AA50 map made for like $60. Did it at FedEx Office Print & Ship Center… I would imagine you have one like that in Jersey… also maybe try a Kinko’s if you have one of them. If you can’t find one locally, try the FedEx online shop and have it sent to you.